Sold by Owl Sell That and Fulfilled by Amazon. Gift-wrap available. Sold by Owl Sell That and ships from Amazon Fulfillment. 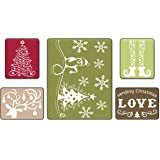 Transforms ordinary card stock into beautifully embossed works of art. 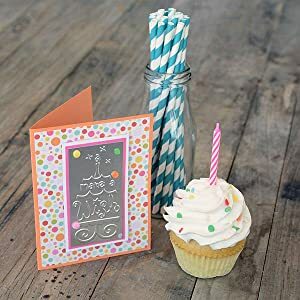 Make cards for any occasion. 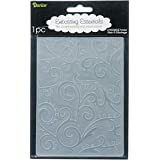 Now it's easy to make embossed cards and envelopes for any occasion. 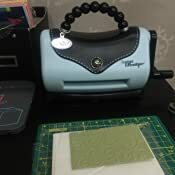 The Sizzix Texture Boutique Embossing Machine is light weight and small, but solidly built. It's an affordable embosser that's perfect for beginners or experienced crafters alike. 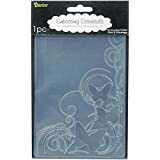 Embossing folders are the key to transforming ordinary card stock and paper into amazing 3-dimensional art. 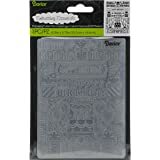 The Sizzix Texture Boutique Embossing Machine works with size A2 (4.25 x 5.50 inches) embossing folders from Sizzex and other manufacturers. Makes a great gift. Compact size fits any space. 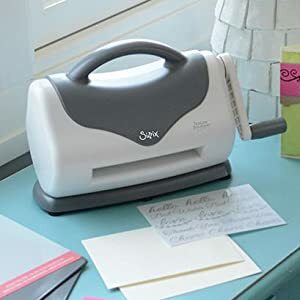 The Sizzix Texture Boutique Embossing Machine is perfect for small craft areas with limited space. It embosses beautifully like larger machines, but it's light weight makes it portable and easy to move. Perfect for craft and scrapbooking parties. Provides endless hours of fun and creativity. Fun is in the cards for you. This amazing cardmaking and embellishing system creates cards for any occasion, while transforming ordinary cardstock into elegant embossed art with the help of Sizzix Textured Impressions Embossing Folders. 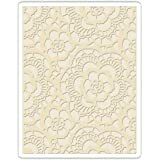 Resembling an ornate purse with a beaded handle (measuring 8" x 5" x 9", plus 2 1/2" handle), this fashionable cardmaker embosses and embellishes in just seconds, using Textured Impressions Embossing Folders (sold separately). 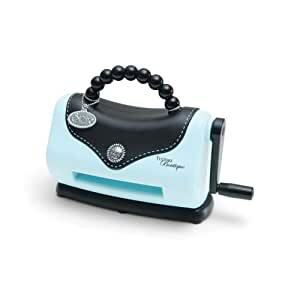 Included with the Texture Boutique Embossing Machine is a pair of Embossing Pads and one Mylar Shim. Please note, the Texture Boutique Embossing Machine embosses only; it does not die-cut. 5.0 out of 5 starsA Great Little Machine! ~Darice folders in BOTH A2 and 5x7. I would suggest using two shims* if you have them. If not, cut a cheapo plastic cutting board to use as an extra shim. ~M-Bossabilities in 5x7 works only if you shave the extra space off on the sides. The folder was maybe a little over 1/8 of an inch too wide so hardly anything had to be shaved off. In conclusion, this post is now the evidence that you can use other sizes of embossing folders, by other manufacturers as well, and that it STILL WORKS! *I purchased an extra set of embossing plates for a few bucks on Joanne's which is why I have two shims. However, I initially bought it in preparation to experiment with nestabilities one day. I have been waiting a long time to own an embossing machine. The first time I saw one demonstrated (about 5 years ago) was at a home party, using a plain white envelope, and I immediately loved what it did. I never wanted to pay the price for it, though (nearly $100). Recently, I was browsing my local craft store, and saw this cute embosser. 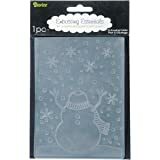 It does not cut shapes, as some of the larger Sizzix models do, but I really only wanted the embossing feature. This machine works with the embossing "envelope" I bought a year ago, and I made my first pattern on an invitation-sized envelope. It came out beautifully and was fun and easy to use. 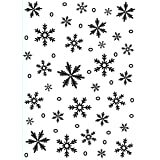 I would recommend it to anyone who wants to impress one's own cards (about 3 x 5") or envelopes with a lovely pattern. The best part is that the price was about 1/4 of the larger models, and I didn't pay a penny, having used an Amazon gift card! 4.0 out of 5 starsNice starter embossing macine! 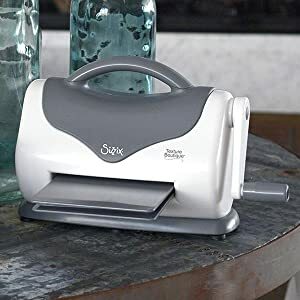 this is a great little embosser! It is small, though. you can only use the smaller embossing folders with it. But if you only need to emboss it works good. I just make small shapes and emboss them to add to the front of my cards! 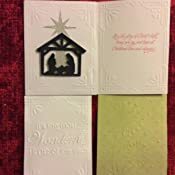 I would like to find an embosser that you can create a larger embossed area, but I have only found that on embossing and cutting machines. 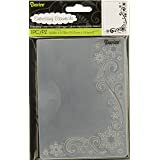 Since I don't need a cutting mach ( I own the silhouette cameo) I would really like to find just an embosser that uses larger sized folders! It is a great little starter machine for crafters, though! 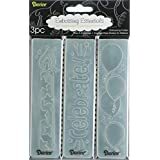 I bought this embossing system to assist me with my handmade card making. 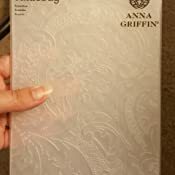 It is of very nice quality, and works very nicely when embossing cardstock. 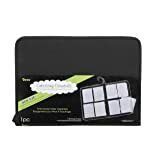 It comes with a lot of things you need to get started, including some very cute embossing folders, and some great cardstock that you emboss on and then use sandpaper on it to reveal a lighter colored design. It is very easy to use, and I have had no mishaps. I have since gotten a bigger version, the Big Shot, so I don't use this one anymore. I am thinking of gifting it to my 8 year old niece, though, because she will love using it in her arts and crafts.